Rhodes occupied a vital strategic position in the south-east Aegean and fertile terrain, and, thanks also to the commercial sense of its inhabitants, played an important role in the Aegean from as early as the 5th millennium BC. Towards the end of the 3rd millennium, the development of trade led to the creation of an early form of township, and Rhodes developed into major cultural crossroads astride the routes from the north-east Aegean and the Asia Minor hinterland to the rest of the Aegean and the north-east Peloponnese. All three Rhodian cities, Lindos on the east coast, Ialysos near the north end of the island, and Kamiros on the west coast, struck Archaic coins before the synoecism of 408 BC. 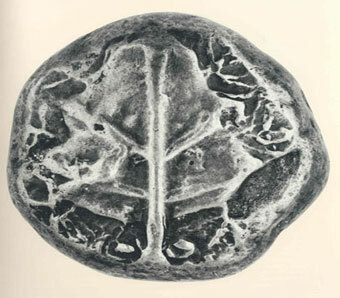 Beginning in the early 4th c. BC, the mint of Rhodes developed into the most important in Karia. When the cities were liberated from Athenian rule in 411 BC, they created a new capital that bore the same name as the island itself. After that time, coins were struck only in the name of the Rhodians. 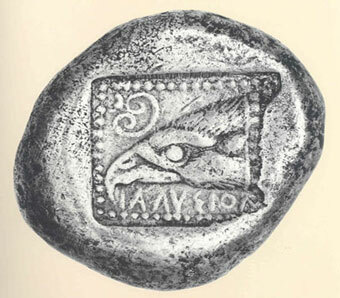 The famous tetradrachms of Rhodes bear a depiction of the head of Helios, identified with Apollo, which is the main numismatic type on Rhodian coins. 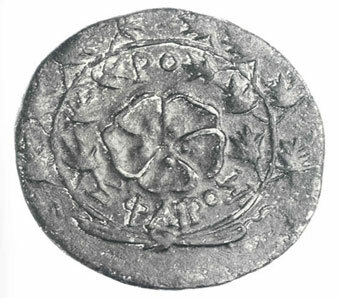 The representation of the rose on the reverse is a «punning representation» of the name of the city (rose, in Greek rhodon), which was famous for its roses, after which it was named. 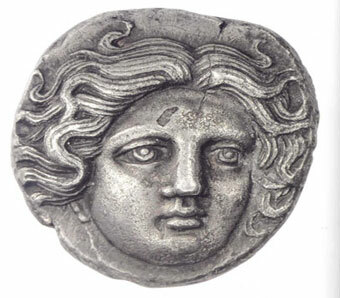 The frontal depiction of the head of Helios on the didrachms of the middle of the 4th c. BC, which has an astonishing expressive force, is influenced by the head of the Syracusan nymph Arethousa, as rendered by the engraver Kimon. This numismatic type continued to be found on the plinthophoroi drachms of the 2nd and 1st c. BC; these also circulated widely in mainland Greece, since Rhodes played an important role as a naval and commercial power in ancient times.